We set the highest quality standards for our programs and combine this with providing top-quality equipment. Our services are transparent with the aim of making them the best they can be. We are a member of the Guarantee Fund for the Swiss travel sector, which guarantees the security of your customer credit. Our tours take place in all weather conditions. In difficult weather conditions, it may happen that we are forced to amend the tour program or transfer the tour to another area – this is for your own safety and to ensure continued enjoyment of the tour. Trust us, we love spending time in the mountains too and strive to ensure that you get the most out of your experience. Fantastic mountain experiences, good weather and great touring conditions all promise successful days spent touring. As we are a team in the mountains, every participant and guide contributes to shaping positive mountain and holiday experiences. Safety is our top priority. We only offer tours that we can take account for, both in terms of participants and guides. We also respect nature and her boundaries. As well as this, ongoing training guarantees professionally guided tours. 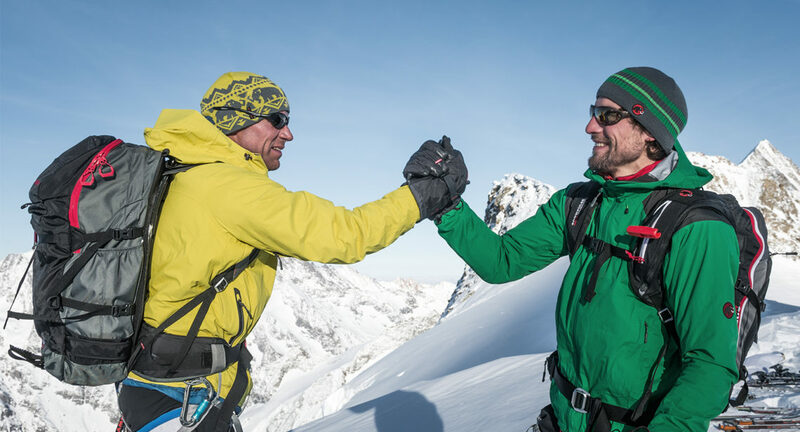 Our offers are allocated to guides dependent on location and route requirements and are led by IFMGA (International Federation of Mountain Guide Associations) certified mountain guides or SBV/VDBS (Swiss/German Mountain Guide Association) certified hiking leaders in compliance with the applicable guidelines. Trainee mountain guides are used as additional support for double-sized groups. We also have Safety in Adventures certification, which specifies recognized safety guidelines for outdoor and mountain activities. We are committed to a responsible approach towards nature, our natural environment. Our offers are designed so that you can reach us by public transport. Plus, we offer you the option to compensate for the CO2 emissions generated during the tour at the time of booking.